For every situation in life you need to run on the appropriate level of emotion. Too much emotional ‘leakage’ into a experience can spoil the experience. You make great strides towards confidence when you begin to relax in a greater range of situations. The second part of self confidence is about being able to relax with uncertainty. To be ‘cool’ in a situation really means relaxing with not knowing how things will pan out. If you truly tolerate uncertainty, you can do pretty much anything. 3. Not being too concerned with what others think of you. You know when you imagine what some place is going to be like before you go there but when you get there it is totally different to your imagination? That’s how reliable your imagination is! Stop trusting your imagination so much. I’ve long since stopped bothering to imagine what others think of me because so often I’ve turned out to be wrong. 4. Being specific – where do you want confidence? ‘Confidence’ is meaningless until you tie it to something specific. You are already confident that you can read these words or can switch a light on and off. So you don’t need more confidence everywhere. To get what you want in life you have to establish exactly what you do want. Where do you want confidence in your life? Think about the specific situations now and write them down. You are beginning to steer your brain towards confidence. Your brain is an organ that needs clear goals to work towards. When a task has been set in your brain it will do everything it can do to bring about the completion of that task. If you’ve tried to recall someone’s name but can’t, hours later you’ll often find their name pops into your head. Instead of: ‘I don’t want to screw up’ (which sets the task of ‘screwing up’ for your brain), set the blueprint for what you do want! Your brain doesn’t work towards what to do by being told what not to do. And nature has given you a wonderful natural tool to set the right task blueprints with. Now you understand how vital it is to set the right task for you brain, you need to know how to do this reliably. Good hypnosis will strongly ‘program’ the right blueprint in your mind through the use of your imagination. If you powerfully imagine feeling confident and relaxed while in a relaxed hypnotic state it will be hard for your unconscious mind to do anything else. The blueprint for relaxation has been set firmly into your subconscious mind. 1. Think specifically of the time/place/situation you want to feel confident in. Remember ‘confidence’ doesn’t mean anything until you attach it to something specific. 2. Focus on words in your mind right now that describe how you do want to be in that time and place. Maybe words such as ‘calm’, ‘relaxed’ or ‘focused’. Remember your brain works on clear positive instructions. 3. Close your eyes for as long as you like and think about how those words feel. Then, imagine the situation itself and rehearse it in your mind feeling confident and relaxed. This way you set the right blueprint or ‘task’ for your unconscious mind. You can repeat this often to make it more effective and use it with as many areas of your life as you need to. If you listen to a hypnotic cd or download that can make the benefits even more powerful (see the link at the end of the article). So if you feel like you’d be blessed with less confidence than some other people you can start redressing the balance by using your mind in the right way right now. 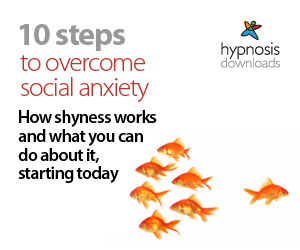 This article was written by a professional hypnotherapist Mark Tyrrell of Hypnosis Downloads.com.